DOT DAY 2017–Another Day of Making our Mark! We had a SUPER Dot Day this year, and a lot like last year, there was too much fun for just one day! Oh, and I realized that I forgot to mention that in addition to The Dot, we shared many other Peter Reynolds titles, and sang another Emily Arrow song, too! OK, moving on…If you read the post from Dot Day 2016, you’ll notice a fabulous Skype opportunity we had with Ms. Hachen’s class from Kansas. This year we were not quite ready to chat with a “stranger” class yet, so Ms. Turken and I figured out a way to have our first graders learn what to do–with each other! We had a plan to share our dot creations with each other, as well as prep kiddos for our Skype journey for this year. We started our Friday with a quick flip chart to introduce kiddos to what Skype actually is and how it works. We practiced how we would have a greeter (we decided the helper for the week could easily do this); how they would come to the computer and what they would say; as well as what everyone else should do while it’s not their turn (spoiler: they should sit quietly and watch and listen!). I even gave them a few seconds to do that crazy thing that kiddos always do when they first see themselves on the screen; allowing them to make faces and be goofy for a minute helped quell that desire for once we actually got started. We headed over with our dots in hand and got all set up. I was so impressed with how well they did, how the mostly were quiet and listening, and how I am sure they’ll know what to do when it’s “for real.” YAY!! And speaking of Dot Day creations, here they are. Can’t wait ’til they are up and displayed for us to see! Of course, I’ll share again once that happens, but they were too good to keep to myself! Aren’t those amazing? And you know, they so inspired me that I had to join in. I didn’t do it on actual Dot Day (hope that’s ok), but I did indeed make my mark and make a dot creation with my daughter today (who is also a first grader!). Hour of Code: Our Favorite Part of the Week! Remember when I showed this picture from my last post? Remember that kiddos wanted to code? Well if we had asked them that a week before, many of them would not have had any idea of what that even meant. But thanks to friends in our school like Ms. Turken (our Rm. 203 neighbor) and Mrs. Sisul (our AMAZING principal), we are now ROCKSTAR coders and LOVE to spend any minute we have creating with code.org and our Scratch Jr. app on our iPads. In response to that question I asked in our teacher group, Mrs. Sisul suggested that she come spend some Hour of Code time with my class. OF COURSE I said yes! She started by explaining to Rm. 202 kids how they are all smarter than computers. Some of them weren’t so sure about this, but then she explained that everything a computer does has to be entered by a human, who writes in a special language telling the machine what it should do. Then we watched in intro movie about people who code and how and why they do that. Next she explained about how there are two languages that computers understand, BLOCK and JAVA SCRIPT. We were going to start with the block kind of coding, using a really popular movie as our topic–STAR WARS!! We have been working on getting our Writers’ Workshop set up, as well as learning about and writing Small Moments. Wednesday was the day we were finally ready to share our finished writing pieces. This was our first for the year, and so we did have to start with a few instructions on how it would go. 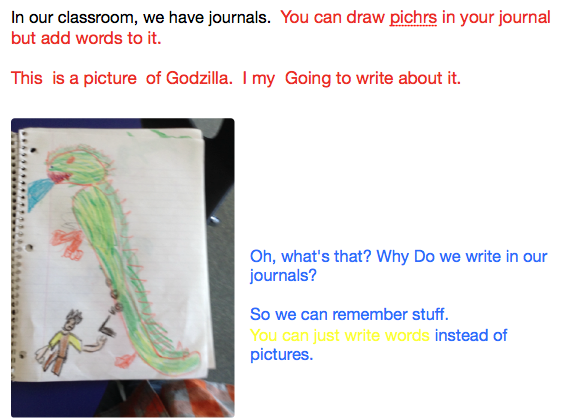 I also tried something new this time (which, by the way, I SHOULD NOT have done on our first try at a writing celebration…oh well, lessons learned), and had kiddos do writing compliments on their iPads using eBackpack and the MarkIt tool. Writers circulated and read their friend’s stories, leaving kind words about what they noticed and what they liked. 2nd Day of 2nd Grade Selfies! 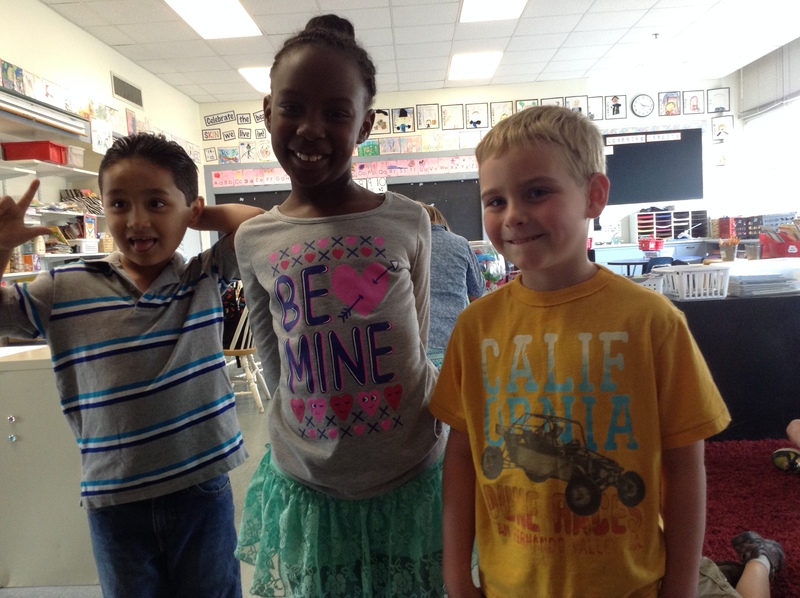 Last year we shared our super-sweet pics of ourselves on the 1st Day of 1st Grade. So what could we do this year but share super-cool pics of ourselves on the 2nd Day of 2nd Grade?? While some of these are silly and some are serious, I think in many ways they show the personalities of the kiddos who took. And if I’m being honest, they weren’t all actually selfies, because I told them where to stand and probably micro-managed the whole thing a little too much. Boo. 😦 Sorry! But the whole idea of selfies came from this article posted by my principal in our school’s ShareTank (which is a Facebook group where teachers can share learning and ideas with each other). It’s all about using selfies and other strategies to give kids more control and voice in the classroom. It is, after all, OUR classroom not just mine. And I know from the work I did on my Masters’ project last fall that choice and voice in the classroom increases engagement and perseverance, so why not?! I feel like I tend toward this direction anyway, but I can always do better at making sure my students are helping to direct their learning, with me alongside helping to facilitate that journey. I feel honored and humbled to have that opportunity. 🙂 Here’s to a great year of student-centered, student-directed, everyone’s-engaged learning!! Somehow I think I’ve started a new feature: Picture of the Day. It’s actually something I was thinking about trying my hand at for next school year (because I need something else to do, right? ), but in true form, I decided to try it now, too! (And I should get over to my family blog and pick it back up, too, shouldn’t I? That’s actually where I first got the idea….oh well, one project blog at a time I guess….) Anyhow, it’s funny how you look at things differently when you know you want to post something every day. It’s kind of like how I teach my kiddos that writers look at the world differently than “regular” people–they EXPECT to see interesting things that they can capture in words, and sometimes in pictures! So today when someone said, “Hey, look, they all have on the same shoes!” I HAD to take a picture of it. 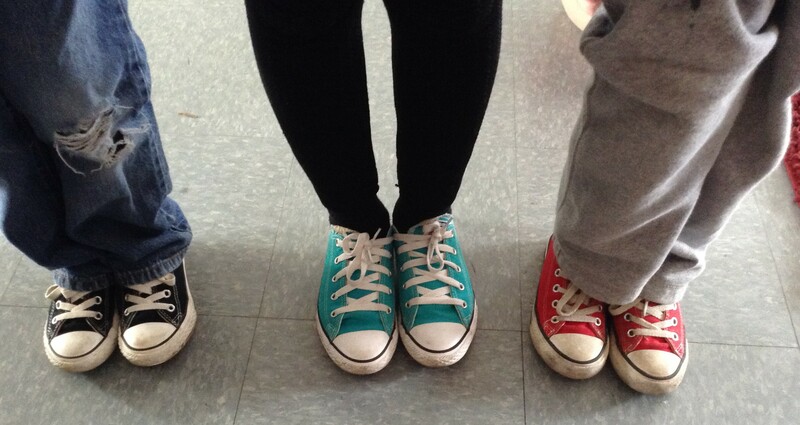 That’s our first picture of the day–cute first grade feet in Converse tennis shoes, all in different colors and sizes! And since kids can’t get all of the focus here (after all, there is 1 KOOKY TEACHER in Rm. 202, too! ), my friend Landen took a picture of something else cool we noticed today: Mrs. Appelbaum (she’s kind of like a celebrity around here lately!) 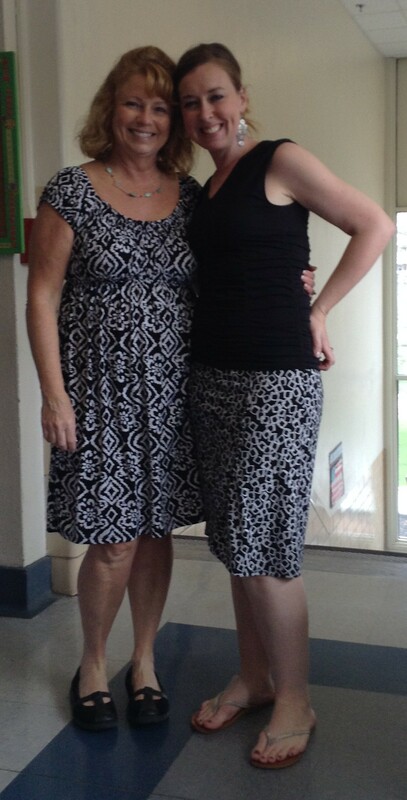 and I were twinsies with the color and patterns in our outfits! And I must mention that Landen both offered to take the picture AND AirDrop it to me so I would have a copy. 🙂 Gotta love those growing tech skills, huh? Guest Authors: Peyton and Thomas–Journals! 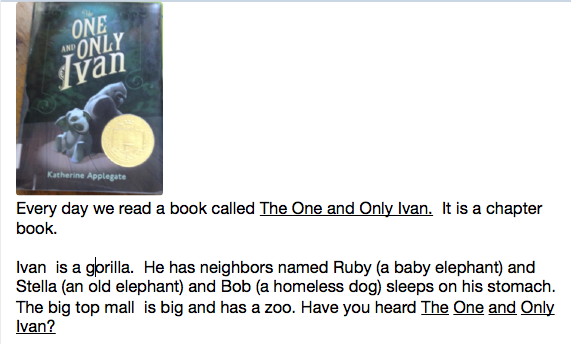 Guest Authors: Charlie and Diego–The One and Only Ivan!